Dutch spiral stitch is a variation of the peyote stitch. Fine Austrian crystals, white silver spacers, and the Dutch spiral stitch combine in this pattern to make a lovely pair of earrings. Instructions included step-by-step photographs of starting the Dutch spiral and finishing the earrings to secure the eye pins and tighten the stitch to make a solid set of earrings. 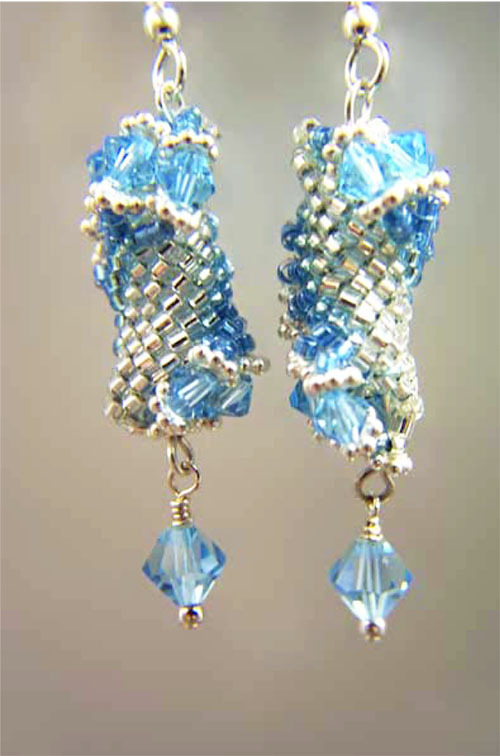 A wire-wrapped dangle completes this graceful and elegant design. Earrings measure 2 ¼ inches (5.72 cm) from the top of the French hooks to the bottom of the dangle.